This year's floods have led to a near 100 per cent increase in population numbers of some species of kangaroo. HEAVY RAIN IN QUEENSLAND this year has meant diseased fish in one harbour, but on land, it has sent the kangaroo population soaring. The Department of Environment and Resources Management argues the plight of Gladstone Harbour's marine life is not due to dredging, but from problems associated with a massive influx of fresh water from this year's floods. But aerial survey data indicate a significant increase in kangaroo numbers in Queensland, thanks to increased vegetation. "It is estimated the red kangaroo population is 5.8 million compared to 3.6 million for 2010," the department's environmental services regional manager Dr Chris Hill said. "This represents a 59 per cent increase." "Equivalent figures for the eastern grey kangaroo are 10.8 million, compared to 6.6 million, or an increase of 62 per cent," he said. "Common wallaroo figures have risen from 1.9 million to 3.8 million representing a 97 per cent increase." Chris added that these increases were not unexpected given the above average rainfall experienced over the last two years across much of Queensland. Kangaroo Industry Association Australia executive John Kelly told reporters that another factor was that the demand for kangaroo meat had fallen by half of what is was before the Russian government suspended market access to 300 meat producers from 25 countries, including all kangaroo exporters. THE future of Waratah Park is a step closer to being secured after the rejection of a land claim and a possible inclusion of the site on the NSW Heritage register. Last week the state government announced it had knocked back a land claim by the Metropolitan Aboriginal Land Council on the 12ha home of Skippy. The claim was lodged in June 2010 after the termination of the park’s lease and the removal of the site’s remaining native animals. Warringah Council has now moved to preserve the site recently lodging an official nomination for Skippy Park to be included on the NSW Heritage Register. Waratah Park Nature Reserve Foundation welcomed the move and will now host a fundraising event on Sunday at Manly Vale Community Centre to help prevent the land from being privately acquired by developers. Lightning flashes over Ayers Rock, a landmark red sandstone monolith that draws tourists to Australia's center. Uluru-Kata Tjuta National Park houses the rock, called Uluru by Aborigines, the continent's original inhabitants. Australia's Aborigines believe their ancestors formed massive Ayers Rock, or Uluru. The remote Kimberley region in Western Australia features dramatic landscapes filled with river gorges and sandstone formations that were featured in the 2008 film Australia. The Kimberley is also home to the massive boab tree, close relative of the African baobabs. Aborigines kick up dust in a dance at sunset. The original inhabitants of Australia, Aborigines were there for more than 40,000 years before white men arrived. European settlers brought disease and politics to the continent, severely endangering the Aborigines’ distinct culture, language, and lifestyle. A heavy-lidded koala keeps its cool nestled in an Adelaide tree. 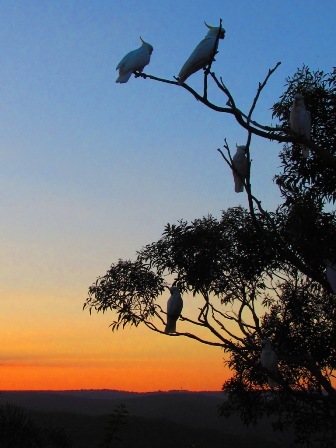 These eastern Australian residents spend most of their time dozing in eucalyptus trees, waking up at night to feed on the trees' tough leaves. A joey gets a ride from its mother in Victoria. A national symbol of Australia, the eastern grey kangaroo has been known to leap up to 29.5 feet (9 meters) in a single bound as it traverses eastern mainland Australia. The eastern grey is one of approximately 63 species that are native to Australia. Eight towering limestone monoliths make up the Twelve Apostles that sit on Great Ocean Road in southeastern Australia. The structures, once a part of the towering mainland cliffs, now sit about 80 feet (24 meters) high and 20 feet (6 meters) wide in the midst of crashing waves. Crystal Shower Falls is just one natural attraction in New South Wales's Dorrigo National Park. Boardwalks on the forest floor and the treetop level let visitors experience the rain forest up close. The smooth, sandy shorelines of Australia’s Whitsunday Islands and the natural wonder of the surrounding Great Barrier Reef draw tourists from around the world. Many of the 74 islands are designated national park land while others play host to luxurious island resorts. What better way to either embrace winter or escape it altogether. Here are our picks for top getaways. A great place to also spend your summer days, this alpine resort turns into a winter wonderland as the mercury drops. If you're hitting the slopes you'll find some of Australia's steepest expert terrain, and with the Super Pass you can access Falls, Mt. Hotham nearby and Perisher. That's a lot of snow time! IT'S HARD TO IMAGINE, but when chillies first arrived in Europe with Christopher Columbus nobody knew what to do with them. The Spanish and Portuguese grew the fruit in their African colonies and from there it was introduced to Portugal's colony at Goa, India before spreading into Southeast Asia, China, and Korea. Australian Geographic, a group on Flickr. An ancient dragonfly species has been found in two wetland locations, dramatically increasing its known range. The ancient greenling damselfly in the Grampians NP (Credit: Reiner Richter). THE DISCOVERY OF a tiny damselfly - which is the only living example of a prehistoric group of species - in two new Victorian locations, has lifted hopes that the insect is moving away from the brink of extinction. The ancient greenling damselfly (Hemiphlebia mirabilis) measures just 2.4 cm long and was only previously known from nine sites in Victoria, South Australia and Tasmania. Hard to spot, the metallic green species has now been detected in wetlands at Victoria's Grampians NP, much to the delight of scientists and dragonfly enthusiasts. "The rarity of the ancient greenling and its small size mean the species is difficult to locate. The adults are only present from late spring to summer, while the aquatic larvae remain hidden in the water for the rest of the year," says lead researcher behind the finding Dr Di Crowther with Victoria's Department of Sustainability and Environment (DSE). "Not only are the adults brilliantly camouflaged in amongst the reeds of the wetlands they inhabit, they are tiny, with a wingspan of just 22 mm and length of only 24 mm," she says. Damselflies are relatives of dragonflies in the order Odonata - while dragonflies have wings that stick out at right angles when they are resting, damselflies can be recognised by wings that lie flat against the body while resting (see image, above). The ancient greenling is the only living relative of the Hemiphlebiidae family, whose predecessors are found only in 250- to 300-million-year-old fossil records from Brazil to Russia. This makes the species a "living fossil", says Di, who says that although the find is significant, the ancient greenling isn't out of the woods just yet. It is highly sensitive to changes in its environment and was last sighted eight years ago in Yea and Alexandra, in Victoria's north. Other populations at Wilsons Promontory had been battered by fire and shrinking wetlands, which the species needs to survive. It is not known if the species can fly long distances which would allow it to find new breeding grounds. "This find is really significant because that gives hope that maybe there are other populations out there that haven't been found yet," Di says. "Hopefully it points to the species being sound. But there are concerns that they are really sensitive to any impact and they will just drop out." A genetically diverse population is needed to prevent inbreeding and save the species from extinction, she says: "Every new site found is another step away from extinction." The adult ancient greenlings, which are only present from late spring to summer, were discovered at two Grampians wetlands in late 2010 by dragonfly enthusiast and photographer Reiner Richter. The DSE will continue its research of the species at several of Victorian sites including Yea Wetlands, Wilsons Promontory National Park and the Long Swamp complex in the state's southwest, as well as the new Grampians sites. A staggering number of species in this Western Australian wilderness are at threat if action is not taken. Gouldian finches are one of many threatened Kimberley species (Credit: Bruce Doran). UP TO 45 NATIVE species in Western Australia's Kimberley region will die out within 20 years if no action is taken, a CSIRO-led study says. It's called for an immediate cash injection of $95 million to save creatures, including the golden bandicoot, the scaly-tailed possum and the monjon rock wallaby from extinction. "We're in the midst of an extinction event in Australia and the north has been the last stronghold for many native species of wildlife," says Dr Tara Martin, a CSIRO ecologist at the University of Queensland and co-author of the report. "Thirty per cent of the threatened species identified in our study are unique to the Kimberley region, while others, like the golden bandicoot, have already disappeared elsewhere in the country," she told Australian Geographic. "The Kimberley is really their last chance on earth." The study - announced on Wednesday at a Canberra event organised by the Wilderness Society, who also commissioned the report - goes on to urge all tiers of government to open their wallets. At the moment, just $20 million a year is spent on conservation efforts in the Kimberley, which is home to an assortment of threatened species. But the report says even if that money was spent properly, the region would still lose some 31 native animals. The numbers of many more birds, reptiles and mammals, such as the spotted tree monitor and the western chestnut mouse, would dwindle. The report says that controlling feral cats is the best cost-effective measure to prevent species decline: this would be a three-pronged attack, including education, research and an end to dingo baiting. But it conceded the "feasibility of success" was low. The next best thing would be to effectively manage the threats of fire and foreign herbivores, which would see improvements for almost all wildlife species. "This report is like a business plan for nature," co-author Professor Hugh Possingham says. "Our analysis shows the best bang for the buck and identifies not just the best things to do but what we can't afford not to do." About $40 million would be needed annually in the Kimberley to protect its species, as well as boost plant life, help the climate and conserve indigenous land. "This investment is great value," says Hugh, also based at the University of Queensland. "We can save some of Australia's most iconic mammals and birds at a cost of only about $1 million, per species, per year." The Priority Threat Management to Protect Kimberley Wildlife report relied heavily on expert feedback because of a lack of available data on certain species and costs. It recommended getting other social, economic and cultural perspectives to round out a more comprehensive action plan.